Whether you’re a small business, influencer, brand, or just looking to engage with more people on your personal account; everyone wants to be shown a little SML (Social Media Love.) If you’re looking to increase your social media engagement then you’ve come to the right place. With Instagram’s ever-changing algorithms, it can be hard to maintain steady traffic to your profile causing your engagement to fluctuate. But never fear, we are here to help! 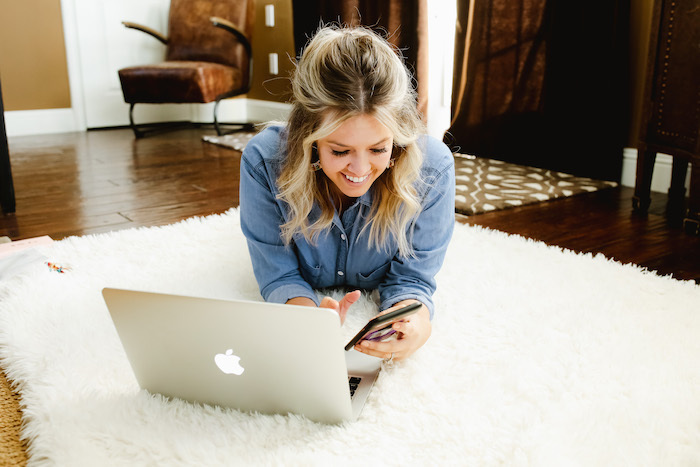 As a small business owner of a creative studio and lifestyle blog based in Fort Worth, I have experienced first hand the rewards of a successful social media marketing strategy. My team and I work with other small businesses all over the US to help them utilize social media to grow their business. Our goal is to create a social media marketing strategy that will deliver the most return on investment. Which means making sure every post is the most engaging it can be. Follow along as I show you a few simple steps to increase engagement, boost traffic, and grow your account naturally. There are two ways. To manually calculate the percentage for a singular post, try this. Let’s say your total likes were 137 and your total comments came out to 10. Add 137 + 10 = 147. Then take 147 and divide it by your total # of followers, and times it by 100 to give you the percentage. Ex: 147 / 2,500 x 100 = 5.8% Engagement Rate on specific post. If you’re looking to find the overall Engagement Rate for your account www.phlanx.com is a great tool. For a small fee you can measure engagement rates, contact influencers, create contracts, and audit Instagram accounts. Why is your Engagement Rate Important? As a small business, influencer, or brand it’s easy to get hung up on your follower count. But take it from me, your engagement rate is what you should be focused on. Wouldn’t you rather have a smaller amount of followers who genuinely love your social media account and are constantly and consistently liking and commenting on your posts rather than a massive audience that is only partially interested in what you’re posting? If you have engaged followers not only have you earned their trust, you’ve built a relationship with them. Engaged followers = authentic audience. Once you’ve established an engaged audience, they are ready to buy whatever it is you’re selling. How can I Improve my Engagement Rate? Ok this one is important y’all! I know it may sound crazy but you’ve got to engage with your competition and… gulp… be active on their feeds. Swallow your pride and take some time to interact on accounts that are similar to yours. By interacting on other users that are like yours, not only are you increasing your chances of being seen…you’re increasing the amount of engagement you’re going to get from new visitors to your profile. Let me break it down, if your Instagram is a cooking account, interact and engage with other cooking instagrams, food bloggers, and popular restaurants in your area. If you run a fashion account, interact and engage with other fashion bloggers, fashion labels, and fashion inspiration accounts. By doing so, you’re getting in front of the correct audience and your account will be seen by people and brands who are interested in whatever it is YOU’RE selling. Face it, people love free stuff. Doing a giveaway on social media is a great way to increase your follower growth and draw new visitors to your profile. In order to increase your engagement through an Instagram Giveaway, make sure to include in the rules to enter you must follow your account, like the giveaway post, and tag friends in order to win. This gives you a huge boost as people will tag their friends who may or may not know about your account, who will then tag their friends and so on and so forth. This is an easy way to reach a broader audience and your chance to interact with new followers. Try incorporating a question into all of your captions. This helps you get to know your social media audience while increasing your engagement rate at the same time. Instead of asking generic “yes” or “no” questions, which are less likely to garner a response, try being more specific. For example, if you run a travel account try questions like, “Where are you traveling to next?” or “What is a must-have in your carry-on.” This creates a more personal relationship between you and your followers and, again, drives engagement. In conclusion, all it takes is a little TLC to drive engagement rates on your social media account. Set a goal to spend just 15-30 minutes every day manually engaging, liking and commenting, on accounts similar to yours. Post at least once a day on social media and always try to incorporate a question. Try hosting a giveaway once a month with a company or brand you feel speaks to your account and followers. I promise with these 3 simple tasks, not only will you see a spike in engagement, your followers will increase too. I hope y’all found this helpful and if you have any questions, feel free to leave them in the comments. I love supporting Small Businesses and am here to help in any way I can!